The first time I heard of Buddy Miller was when this 2009 collaboration with Julie was released. It wasn’t the best introduction; I didn’t particularly enjoy it and spent the next few years avoiding any more of Buddy’s music. Listening to it again for the first time in several years, I can report that I do appreciate it better now than I did back then, although I still consider it to be flawed in some respects. Like the first Buddy & Julie collaboration, Written In Chalk is not a country album. It is eclectic in style, which probably appeals to Americana fans, but leaves a lot of gaps for those of us who want something more country-sounding. That being said, the more country-leaning songs are, for the most part, very well done. Julie wrote eight of the album’s twelve songs, including the wonderful album opener “Ellis County”, which finds Buddy looking back nostalgically at a simpler, by-gone era. Julie provides harmony vocals. She also wrote the rockabilly “Gasoline and Matches”, which is catchy but light on lyrics. “Don’t Say Goodbye” is a pretty, piano-led ballad on which Julie takes over the lead vocals – and herein lies the problem with this album: while Julie’s wonderful harmony does much to enhance Buddy’s performances, she is not my idea of a good lead singer. She fails to enunciate her words clearly and I find her voice grating at times. Though a bit dull, this is a song I might enjoy more if it were sung by someone else. The same problem plagues “LongTime” and “Everytime We Say Goodbye”. “What You Gonna Do, Leroy” is one of four songs provided by outside songwriters. This is a Mel Tillis song, which was previously unfamiliar to me, performed as a duet with guest artist Robert Plant. It’s been given a bluesy treatment, along with plenty of fiddle. The percussion is a bit heavy-handed; this is a problem on several of the album’s tracks. Not surprisingly, the album’s best moments are when the production is scaled back. Among the highlights are “Hush, Sorrow”, written by Julie and “One Part, Two Part” written by Dee Ervin. My absolute favorite is the closing cut “The Selfishness In Man”, featuring harmony vocals from Emmylou Harris. “Memphis Jane” is the album’s most annoying track. Mixed bag though it might be, the good on Written In Chalk generally outweighs the bad – and the good moments are definitely worth listening to. Anyone whose resume’ includes a spell leading Emmylou Harris’s backing band is going to be a great musician (just think of alumni like Rodney Crowell and Ricky Skaggs), and this month’s spotlight artist is no exception. Born in Ohio in 1952, where his father was serving in the Air Force, Steven “Buddy” Miller was raised in New Jersey, where he started out playing stand-up bass in his high school bluegrass band. He is now best known for his brilliant guitar playing – and, of course, for his songwriting and production, as well as being an artist in his own right. He met future wife and musical partner Julie Griffin (born in 1956) in Austin, Texas, in 1975 when he joined Rick Stein & the Alleycats, a band of which she was a member (she was a dissenting voice). They subsequently moved together to New York and formed the Buddy Miller Band. Julie’s personal journey led her to leave the band (in which she was replaced by singer-songwriter Shawn Colvin), and she returned to Texas. Buddy followed her, and he and Julie married in 1981, and lived for periods in Texas, Seattle and California before eventually settling in Nashville in 1993. Julie was now set on a career in Christian music. The band Streetlight, which featured Buddy, Julie and one other man, released a six-track Christian contemporary EP in 1983 for the Sparrow label. Julie, a distinctive vocalist and excellent songwriter, began making solo records in 1990, still as a Christian artist. Her solo career slowed after she was diagnosed with fibromyalgia, with no new solo recordings since 1999, but she has continued to work with Buddy, and they have recorded several duet albums. Buddy and Julie found congenial musical company in Nashville, and their songs have been covered by many country, Americana and other artists. Buddy found work playing on sessions, and discovered a gift for producing. He has built a recording studio in his Nashville home, and has been acclaimed for his production work on records by Allison Moorer, Patty Griffin, the Carolina Chocolate Drops, soul singer Solomon Burke, and Ralph Stanley. He served as music director for the second and third seasons of the TV drama Nashville. In c.1995 Buddy became the guitar player for Spyboy, the trio Emmylou formed to support her tour promoting her Wrecking Ball album, and he stayed with her for eight years. He has also toured in the bands of Steve Earle, Robert Plant and Alison Krauss. In 2008-9 he took front stage alongside Emmylou Harris, Patty Griffin and Shawn Colvin on the Three Girls And Their Buddy tour, interrupted by a heart attack from his fortunately made a full recovery. Alongside his sidesman and studio duties, Buddy began recording his own music in 1995 with Your Love And Other Lies. He has interspersed solo records with duet projects with wife Julie, and one with old friend Jim Lauderdale. Buddy’s latest project, Cayamo Sessions At Sea, was released last Friday, with a host of guest stars, and we are delighted to be spending February focussing on his music here. Just after the release of the very similarly titled tribute I reviewed recently comes another project, this one featuring the man himself, produced by Buddy Miller and Jim Lauderdale. Mostly the guests sing lead with Dr Ralph harmonising, but some are true duets too. There is some overlap in personnel (of those associated personally and professionally with Dr Ralph) but almost none with songs. 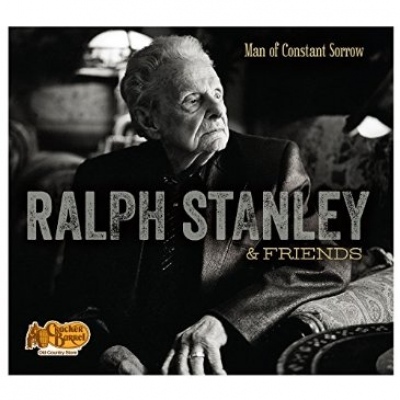 The smooth-voiced Nathan Stanley duets with his grandfather on ‘Rank Stranger’ to great effect. Ricky Skaggs shows up again here with Carter Stanley’s ‘Sweethearts In Heaven’ and combines plaintive emotion with a solid driving rhythm. The big country names all do a fine job. Josh Turner delivers a solid lead vocal on the joyful ‘We Shall Rise’. Dierks Bentley is excellent and sounds very authentic on the high lonesome ‘I Only Exist’. Lee Ann Womack is exquisite leading on ‘White Dove’. The producers join Ralph on a three part harmony on ‘I Am The Man, Thomas’ with Stanley on lead vocal. Americana favourites Gillian Welch and David Rawlings join Dr Ralph on the traditional ‘Pig In A Pen’, which is very enjoyable. I’m not much of a fan of Robert Plant, but his voice combines surprisingly well with Ralph’s on the ethereal ‘Two Coats’, and the effect is very haunting. Rock singer Elvis Costello has never had much of a voice, and while his duet with Ralph on ‘Red Wicked Wine’ isn’t at all bad, it is more or less saved by Stanley’s emotional heft, and the fact that Costello mostly doesn’t get to sing solo. Fellow bluegrass veteran Del McCoury joins Ralph on the Jesse Winchester tune ‘Brand New Tennessee Waltz’. Modern jug band Old Crow Medicine Show join Ralph on ‘Short Life Of Trouble’. ‘Hills Of Home’ is a mostly-spoken eulogy to Ralph’s late brother, the troubled Carter Stanley, which is genuinely moving. This release is currently a Cracker Barrel exclusive but hopefully it will get a wider relase at some point. The loss of a parent is a monumental milestone and common denominator we all share as humans. As ‘The Greatest Generation’ whittles down, our living links to twentieth century history become non-existent. And if you’re like Patty Griffin, you weren’t prepared for this inevitable moment. The gaping hole caused by the death of her father, Lawrence Joseph Griffin, a veteran of WWII, became the geneses for her seventh studio project, American Kid, her first album of all-new material in six years. Self-reflection is one of the great virtues of American Kid and Griffin spends a lot of time in her father’s shoes, panting exquisite portraits of his full-life and grappling with his inner psyche. This approach would’ve backfired in lesser hands, but Griffin clearly knows exactly what she’s doing. A simple acoustic guitar frames “Faithful Son” a haunting manifestation about being taken for granted, while those same feelings of inner pondering are brought to a new dimension on the revelatory “Not Another Man” as a conversation between man and God. “Irish Boy” finds Griffin in a near-whisper as she recounts a failed romance her dad encountered after the war, while she penetrates jubilee on the sing-song-y “Get Ready Marie,” likely the origin story of her parent’s love affair. Both are excellent, although I wish she’d picked up the pace a little on “Irish Boy” – it’s just too slow. “Mom and Dad’s Waltz,” is a cover of the Lefty Frizzell classic, but with Griffin’s delicate reading, you would’ve thought she wrote it herself. First single “Ohio” is one of only a handful of places where Griffin isn’t in deep reflection about her dad and one of two to feature both lyrical and vocal assistance from her beau Robert Plant. It’s a masterpiece, and one of those rare records that only come around about once in a generation. The other is the deeply evocative “Highway Song,” proving these two need to make a collaborative record together before long. Through the winning combination of her gorgeously articulate songwriting and deeply expressive voice (which boasts a remarkably similar tone to Lori McKenna’s), Griffin lays her pain on the floor and bares nothing at the expense of the listener. The record sags in the middle, where one too many slow jams beg for some change in tempo, but the production never obstructs the quality of Griffin’s pen, which always shines through. American Kid is the first fully realized artistic statement of 2013 and one of the more personal albums of the decade so far. Even though I couldn’t say it on my first go around, I’m in love with the beauty and deep penetrating ache of this record and beg anyone looking for the essence of artistry to seek out a copy. Here are some of the country winners already announced on the Grammy pre-show. These are the awards that won’t be televised at the ceremony on CBS tonight. Best Country Song: Jennifer Nettles, ‘Stay‘ … Isn’t it great to see ‘Stay’ get so much recognition? Plus, I think Jennifer is the best thing since penicillin anyway. Best Country Album: George Strait, Troubadour … I’m kinda surprised at this one, but not at all disappointed. This is King George’s first Grammy. Best Female Country Vocal Performance: Carrie Underwood, ‘Last Name’ … Eww. How could Trisha Yearwood NOT win this year? Best Male Country Vocal Performance: Brad Paisley, ‘Letter to Me’ … I thought Jamey Johnson would get some Grammy love this year. Guess not. Best Country Collaboration with Vocals: Robert Plant & Alison Krauss, ‘Killing the Blues’ … Yep. Best Country Instrumental Performance: Brad Paisley, Vince Gill, Steve Wariner, etc. ‘Cluster Pluck’ … I hadn’t heard many of the nominees in this category, but I think Brad got this one on name recognition rather than his skills on the ax. The show starts at 8:00 Eastern time on CBS. Don’t miss Sugarland performing on the show. And be sure to check out the Grammy Live Blog over at Country Universe. This is the category I completely forgot about, so I apologize for cramming so many polls in this week, but I promise, I have a plan. Remember, if you haven’t voted for the Duo/Group poll, please do so here! The results of these polls will be used very soon for a special purpose, so make sure you vote! Make sure to post why you voted for who you did: I love to see the reasoning behind the choices people make!